To verify a biological relationship on your maternal side. To establish whether or not siblings have the same mother only. Best option for a test between maternal grandmother and grandchild. We use most respected and most widely used mitochondrial DNA analysis software in the world. Likewise, the Mitochondrial DNA Test can also be used to test a more distant relationship, as long as the alleged relationship follows the mitochondrial DNA inheritance. It is important to bear in mind that this test cannot pinpoint the exact relationship between those tested, as all individuals in that same family line will have the same mitochondrial DNA. 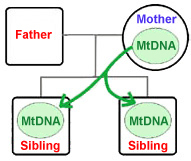 How is the mitochondrial DNA inherited? Mitochondrial DNA can be found in the eggs, which means that all descendants of a woman will inherit this same DNA sequence. Even though men have mitochondrial DNA, they do not pass it to their descendants. All daughters of the same mother will also pass that same mitochondrial DNA sequence to their descendants, while the sons of the same mother will not pass it to their children. Therefore, the Mitochondrial DNA Test is an accurate analysis to verify relationships that allegedly follow that same maternal line. The analysis of mitochondrial DNA is also used nowadays by forensic laboratories to identify bone remains found on war areas by comparing them with possible alive relatives. What is the mitochondrial DNA? Nuclear DNA is inside the nucleus of the cell, and contains all the genes that make us who we are. Nuclear DNA is the one used by the police to obtain the genetic profile of an individual, and it is also the one used in paternity tests. Mitochondrial DNA is a circular chain of DNA inside an organelle called mitochondria, which takes care of producing energy for the cell. Sperms have mitochondrial DNA in their tail, but not in their head. 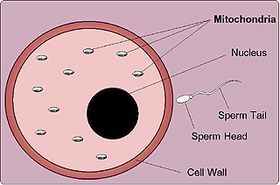 During fertilisation, only the head of the sperm enters the egg, while the tail separates and falls off. Therefore, embryos receive only the mitochondrial DNA from the mother (as it is in the egg), but not from the father. Hence, the Mitochondrial DNA Test can only be used to verify relationships that follow the same maternal line. For example, if we analyse the mitochondrial DNA of two alleged siblings, we can determine whether or not they share the same maternal line.